After months and months (and months) of nothing but citrus, our eyes go wide at the sight of fruit in June. There are peaches at local farm stands, big ol’ watermelons and we had berries in the house as recently as last week. Hooray! This also means that we inevitably end up with a few pieces that are a little past the “fresh”stage. I decided to go the popsicle route with the handful of peaches we had left, but not until after I had already juiced them. 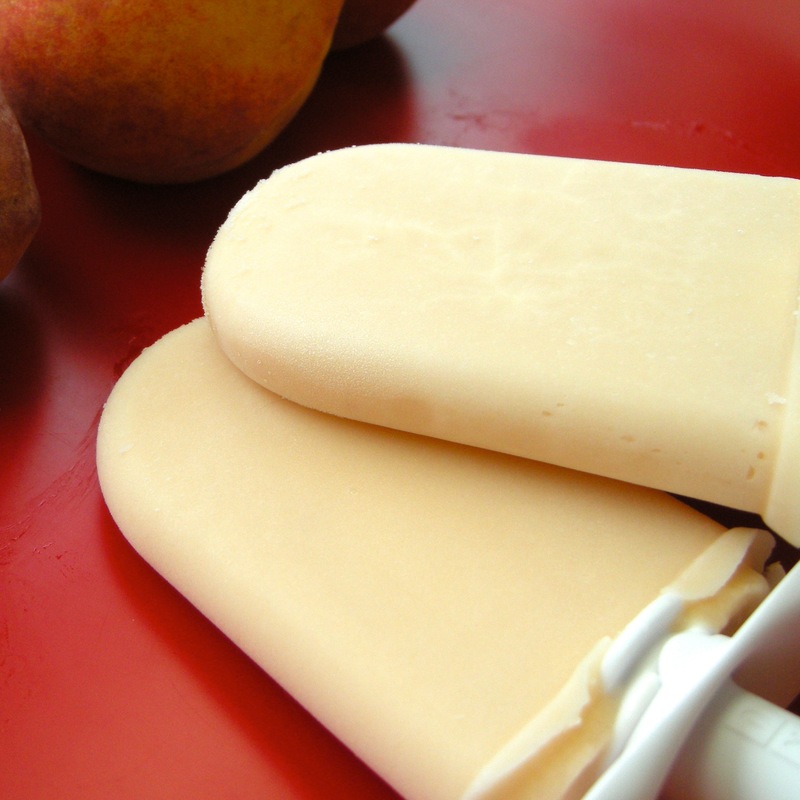 Using juice instead of our usual pureed fruit resulted in a much lighter and creamier popsicle. Combine peach juice and vanilla yogurt in blender until well mixed. * If you don’t have a juicer, you can use a blender, fine-mesh colander & cheesecloth: Place peaches into blender and then pour mixture into a cheese-cloth lined colander. Push pureed fruit through the colander, expressing as much liquid as you can from the pulp. Top off with a little orange juice if you don’t have enough to make a cup. These look delicious! I love that it’s peach season. Hopefully it’s not the same for peaches because this looks delicious! my condolences. A fruit allergy would make me very sad. Peaches are a totally different type of fruit so I am crossing fingers for you!